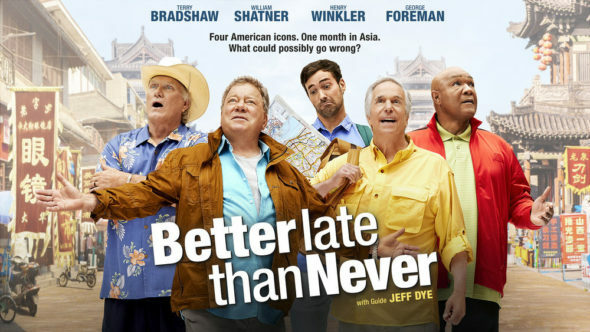 It might seem odd that it’s already time for the Better Late Than Never season 1 finale live stream, considering the reality TV comedy series has only had three episodes so far. The 45-minute show premiered only three weeks ago on August 23, 2016, however, it took a year to produce. If you’re searching for “Better Late Than Never season 1 finale watch online,” or “Better Late Than Never watch online free,” stay tuned for details on the Better Late Than Never live stream. Fans can watch Better Late Than Never s01e04 on NBC, September 13 at 10 p.m. EST. You can watch the station on television, or stream the episode online for free by visiting NBC.com. Henry Winkler, Terry Bradshaw, George Foreman, William Shatner and Jeff Dye are fish out of water as they go on an adventure across Asia. The reality TV series is stylized after a popular Korean television program and follows the group of men as they encounter hilarious cultural experiences, spectacles and unforgettable moments. It all began when the group decided it was “better late than never” to go on the journey of a lifetime, without a schedule or itinerary. Thanks to Jeff Dye, a wiz with technology, they have the help they need with a comedic twist. Dye seems to have an agenda of his own and has no qualms about setting the men down a twisted road. Overall, the show is about five guys who rely on each other for encouragement and support to demonstrate the value of friendship. In Tuesday night’s finale, the teams arrive in Phuket, Thailand and celebrate Terry’s birthday with a water fight. Terry also gets his first tattoo, William and Henry go for massages and George takes the group to watch Thai boxing. It’s definitely going to be an exciting episode –so don’t miss it!